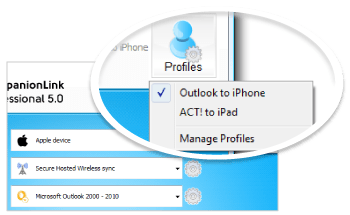 This entry was posted in Tips and Tricks and tagged act!, companionlink, companionlink 5, express, outlook, professional, profiles, sync by David. Bookmark the permalink. Both profiles should be syncing as scheduled. If that’s not what you’re seeing, let me know what your specific setup is so we can figure out what’s going on.